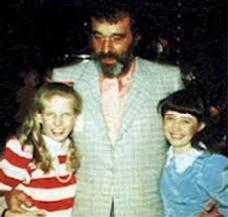 I remember so many fun times from the 80's, being blessed to work with so many great actors / friends. I was going through photos from the "good old days" and found these that I wanted to share. Jason Bateman and me in my Little House on the Prairie dressing room / on MGM sound stage celebrating my birthday..and a candid PR shot of me with fellow Little House cast member's Victor French and Shanon Doherty. In my wildest dreams, could never imagine winning the title of The "VOICE" of the Ocean competition! I was taking a beautiful cruise on the Emerald Princess this year, and found out about the onboard compeition, identical to The Voice TV show, (CCL purchased the rights to the show), and decided to participate. Standing in front of 2,000 fellow passengers, on the majestic Princess Theater stage, singing an iconic Bette Midler song close to my heart, in honor of my father, "Wind Beneath My Wings", was a mentally, and emotionally challenging yet uplifting and healing experience. All of the contestants were super great, and the judges and Princess cruise staff were kind and supportive throughout the compeittion process. I would encourage any one cruising on a Princess ship to go for it! Enjoyed a majical weekend in support of The Annual Best Buddies Challenge at San Simeon, CA. There were thousands of participants who participated in 100 / 30 / 15 mile bike rides along the Pacific Coast on HWY 1, as well as the Carl Lewis 5K run/walk through the privately owned ranch land. The weekend of physical endurance and post race BBQ festivities were all to raise awareness and funds for this national organization focused on creating programs to help children and adults with intellectual disabilites to live a fulfilled and happy life in society. I was thrilled to participate in the special event, and even received a medal when I crossed the finish line! 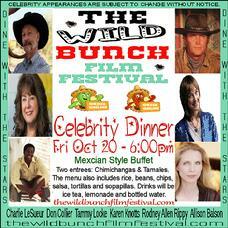 Thrilled to be invited back to attend the 2nd annual Wild Bunch Film Festival, October 20-22, 2017, in Wilcox, Arizona! This year, I will be performing a set of my original songs at the opening night celebratory dinner with emcees Karen Knotts (daughter of legendary comedian / actor Don Knotts), and western televsion/film actor Charlie LeSueur, at The Wilcox Historic Theater on Friday, October 20th. If you are intested in attending to view western themed films nominated for WBFF awards, as well as meet western TV , Film, and Music celebrities, visit the website at The Wild Bunch Film Festival for event details. 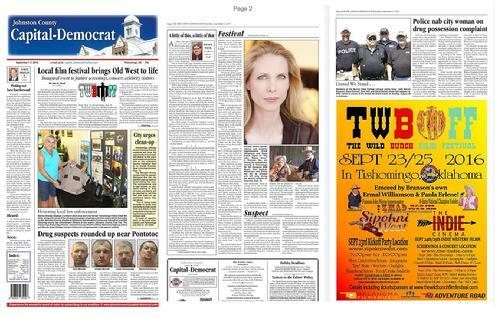 I had the best time attending The first annual Wild Bunch Film Festival in Tishomingo, Oklahoma over the weekend. The hosts, Brenda and Rock Whitehead organized an entertaining, educational, and fun filled three day international film festival. A real old west gun fight kicked off the event at the western themed film set called Sipokni West. I met lots of fans of the Western film genre, and was thrilled to meet the next generation of Little House on the Prairie fans, dressed in perfect Prairie girl dresses. The same evening I enjoyed true country fare, chciken fired steak, breaded chicken, mashed potatoes, green beans and home amde gravy at The Lost Spur Cafe at Sipokni West. The weekend featured numerous films screened at The Indie Cinema on Main Street, and the attendees were entertained by several local musical acts, and the likes of the six time National female yoedling champion, and a John Wayne impersonater. Brief trivia: Tishomingo is the county seat for Johnston County, OK, and was the fist capital for the Chickisaw Nation. It is also the home of country music stars Blake Shelton and Miranda Lambert. For more information on Tishomingo, please visit the Tishomingo City Chamber of Commerce website. I tip my hat in thanks for all of the folks who helped make this special, memorable time become a part of my memories. 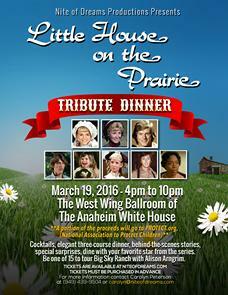 On Friday March 19, I will am honored to join several fellow cast and crew members from the TV series Little House on the Prarie as a special guest for a reunion / fan oriented dinner event at The White House in Anaheim, CA. 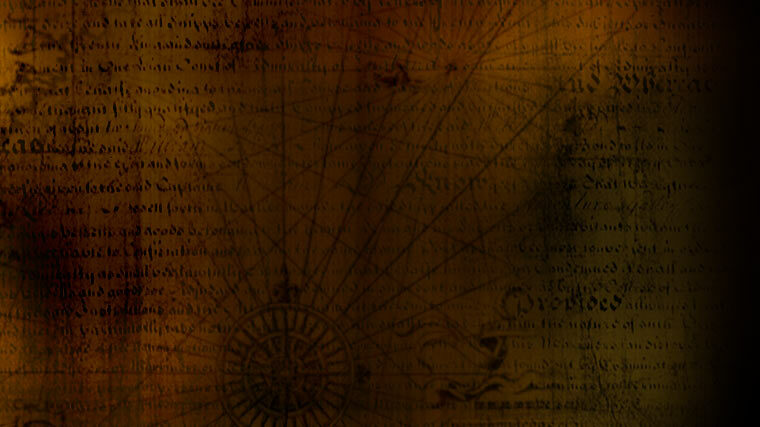 The event is being organized and hosted by the Nite of Dreams organization whose mission is to: "offer an unique way for fans and celebrities to spend time together in an intimate atmosphere - whether it is a gala event, small dinner party, a concert meet and greet, the sky's the limit! This is your chance to have an up-close and personal experience with your favorite celebrity, from television to movie stars to musicians, writiers, artists and sports figures." A portion of the proceeds from this enchanting and entertaining evening will go to the National Association to Protect Children. 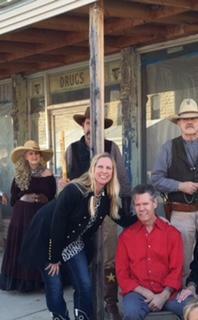 Attended the 1st Annual Billy the Kid Film Festival, Hico TX October 16-18. 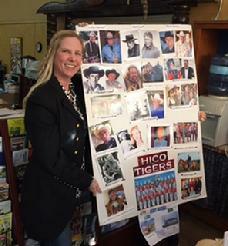 The money raised from the festival went to the nonprofit organization which manages/supports Billy The Kid Museum. The Festival awarded numerous Texas based independent western-themed film projects in categories such as best full length picture, short film, cinematography, director. For me, It was an honor to be a celebrity guest alongside some of the greats from the Western film and television world. I met and became friends with Randy Travis, Ken Farmer, Alex Cord, Charlie LeSueur, Dean Smith, Don Reynolds, and many others. These are the guys who helped create the golden era of Western Film and TV! What I found most amazing about the celebrities is the fact that they are all multi-talented -- actors, screen writers, novelists, directors, musicians, stuntmen, producers, and even real life ranchers! The Festival was so much fun too! Gun fight shows on the old town streets, country line dancers, horse rides, a mock jail, a female Texas yodeler, movie screenings throughout the day, special celebrity guest Q&A panels, and a roast of the celebrities at the gala awards ceremony banquet. I loved meeting the fans as well. They came from all over, and were such a joy to meet. I look forward to being a part of the 2nd annual Billy the Kid Film Festival next year. I wanted to send a big "thank you" to Olathe Boot Co. for providing me with a pair of very cool, rugged, and beautiful boots which I enjoyed wearing during the Fetival. If you don't know Olathe Boots, you need to check them out. Great style, and USA made, Texas manufactured -- "Life is Short -- Ride Hard"! I recently enjoyed sailing the Pacific Ocean along the California Coast on a Princess Cruise. The theme of this voyage was a California Culinary & Wine experience with Iron Chef Cat Cora, and Suzanne Tracht , Chef/Owner of the La restaurant JAR. We were also in the company of " Love Boat " TV star, Jill Wheelan, who is the official Princess Cruise Celebrity Embassador in celebration of the cruise line's 50th Year Anniversary. One of the highlights of my trip, was a very special afternoon tour and luncheon at Fess Parkers Winery located in Los Olivos, CA. Our group of 40, included the celebrity chefs and Jill, as well as Food Bloggers who came from across the US to cover the extraordinary luncheon, as well as the California Culinary Experience Cruise. Kristen who owns and writes Dine & Dish blog wrote a great piece about our voyage together, check out her website at Dine & Dish! I met so many great people during my voyage, and will always remember my days shared with the celebrities, Princess Cruise crew, and Princess Cruise passengers. Nothing like sailing on the high seas and making new friends! 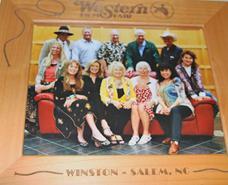 What an amazing experience attending the Western Film Fair & Nostalgia Convention in Winston-Salem, North Carolina! It was great meeting the other celebrity guests, and meeting the fans. I want to thank all of the Festival Board members, the volunteers, and the celebrity guests, and the fans for being so supportive and caring about the preservation of Western themed film and television shows. 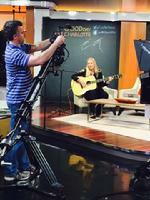 While I was in North Carolina, I headed over to Charlotte to appear on the FOX 46 morning program, "Good Day Charlotte". It was a pleasure meeting the anchors of this terrifc morning show, and having a chance to perform my song "My Friend" which I wrote in honor of Mr. Michael Landon. I also had a great time recording a Music Scene Live radio show on-the-road at The Garage in Winston-Salem. The Bo-Stevens were my musical guest artists, and this band knows how to rockabilly their original county music on stage. The audience loved them, and so did I! 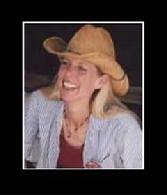 I will be attending the Western Film Fair and Nostalgia Convention, July 8-11, as celebrity guest in Winston-Salem NC. The mission of the festival is to celebrate the Golden Era of Western themed TV and Film. There will be meet and greet sessions, autographs, screening, Q&A panels, and a huge convention hall filled with memorabillia vendors. I am fortunate to also perform my original songs, "My Friend", which I wrote in honor of my memory of Michael Landon at the Celebrity Appraictaion Gala during the event. I will also be taking my syndicated radio show Music Scene Live on-the-road while in Winston-Salem. The show will feature the Bo-Stevens band in live performance in front of a live audience at the music venue The Garage. If you live in the area, come on out. Admission is free and open to the publc. For more information visit Music Scene Live. I has thrilled to be asked to perform The National Anthem again at Brahmas Hockey game at the Fort Worth Convention Center. Stone & I performed our nation's song aco0ustically, and enjoyed the moment with respect and pride. I've posted a video of our performance to the right. Had a great time performing at the Celina Balloon Festival this year! I was also fortunate to be able to take my radio show on the road, and record some of the amazing artists performing at the Festival in "live" performance in front of the festival goers. Lots of fun, lots of beautiful hot air balloons and even sky divers. The "Music Scne Live" radio show is in full swing. We're bringing the best of the Dallas/Fort WorthTX based up-and-comers and well established musical artists to you and listeners around the world, in "live" perofrmance of their original music in front of a "live" audience. I am excited to announce my first broadcast radio show. I have always been a fan of radio and the power of the spoken word. Over the past several months I developed and hosted/produced a radio show called "Music Scene Live", and it is currently broadcast on a North Texas Radio station, KFYN The Warrior, weekly during drive-time. Music Scene Live is a 1-hour radio show that introduces the listeners to singer/songwriters and /or band's orginial music in "live" performance. Please visit the Music Scene Live website to learn more about the show, and listen to the show segments online. 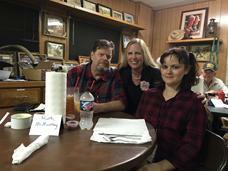 I attended the Premiere screening of the film "Stanley DeBrock" in Louisiana last week. It was a remarkable experience to watch the written story unfold through dramatic visuals and superb acting. I performed my song "Reveal Me" at the Premiere. This was a highlight. of the evening for me. After watching how Derek Wayne Johnson used the song in the soundtrack underlying the love scene between Stone and Diane, my understanding of how a song can help build and support emotions on film really came to light. Wishing all a very Happy Holiday season, with much joy and peace. Derek Wayne Johnson (Writer, Director, Actor, Producer), Allison Balson, George Landum (Producer), At the Premiere Screening of "Stanley DeBrock"
I love music in film -- it creates mood and enhances action. Years ago, I wrote a song for my character to sing in the film "The Legend of the White Horse". And this year, one of my songs written with my musical partner, Stone, has been placed in the film "Stanley DeBrock", a film in which I also costar as Mary DeBrock. Click on the link to the right to watch a recent live performance of "Reveal Me" which will be in the film. Wishing you and your families peace, health and happiness this Holiday! Wanted to share a sound clip from my radio interview on Veteran's Day on behalf of "Operation Happy Note". It's always a pleasure helping this organization share the message about the power of music and how instruments can help relieve the stresses felt by our service men and women oversees, especially during the holiday season whent hey are away from their loved ones. 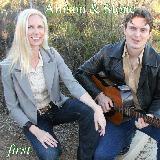 Allison Balson Supports "Operation Happy Note"
Allison & Stone Album "First"
© 2012 Allison Balson; Autumn Productions, Inc.